Over the past two years, the Director of Music at All Saints, Lee Dunleavy FRCO, has given a series of free recitals on the first Thursday of each month from September to May. Over these recitals he has introduced and explored the most significant of J. S. Bach’s organ works. 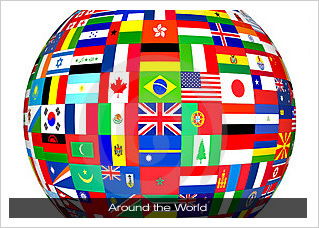 2012 saw a change in programme, as the organist took the audience “Around the World”, focusing each month on repertoire from one country. 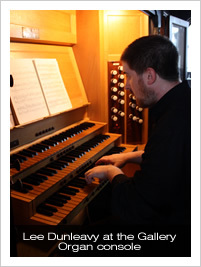 Full details of this very popular organ recital series are below. forty-five minutes, is FREE, with a retiring collection taken. to see as well as hear the performer in action! Music by composers who were awarded the British Order of Merit: Elgar’s Imperial March & Nimrod from Enigma Variations, Walton’s Crown Imperial, and music by Britten, Tippett and Vaughan Williams. After last year’s series focusing on the great Église Saint-Sulpice in Paris, music from all around France: Boëllmann’s Suite Gothique, Duruflé’s Prélude et fugue sur le nom d’Alain, and music by Alain, Fauré and Satie. 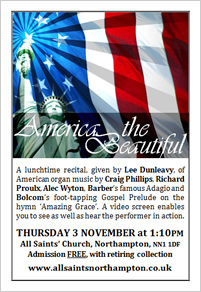 Music from the United States of America, reflecting the recent Festival of All Saints, and Solemnity of All Souls: Barber’s Adagio, William Bolcom’s Gospel Prelude on ‘Amazing Grace’, and music by Craig Phillips, Richard Proulx, John Williams and Alec Wyton. A Christmas Market stuffed full with German seasonal music: J. S. Bach’s Choral Prelude on ‘In dulci jubilo’, Karg-Elert’s Cathedral Windows, and music by Reger and Walcha. Music of The Netherlands from across the ages: Andriessen’s Thema mit variaties, Sweelinck’s Variations on ‘Mein Junges Leben hat ein End’, and music by de Klerk, Monnikendam and van Noordt. In advance of the Boys’ Choir’s tour to Denmark, a organ recital including Nielsen’s last major work, the epic organ work Commotio, Buxtehude’s Passacaglia in d & Ciacona in e, and music by Gade. From a small country with a great organ heritage: Franck’s Trois Pièces, Peeters’ Aria, and music by van der Kerckhoven, Jongen and Lemmens. For a country with very few pipe organs, some of the greatest organ music has been born: Shostakovich’s Passacaglia from his Opera Lady Macbeth of Mtsensk, Mushel’s Suite on Uzbek Motifs, and music by Prokofiev, Rachmaninov and Stravinsky. The twentieth century saw a the first Swiss composers of international repute, amongst them Othmar Schoeck, Ernest Bloch, Frank Martin, Rolf Liebermann, and perhaps most famously Arthur Honegger. Both Martin and Honegger spent much of their careers in other European nations: Martin in the Netherlands and Honegger in France. Prominent contemporary Swiss composers include Klaus Huber and Heinz Holliger, the famous oboe virtuoso who regularly gave recitals here in All Saints in the 1970s. 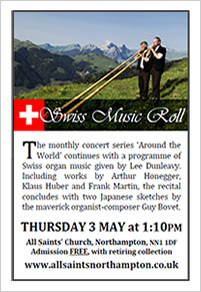 The monthly concert series ‘Around the World’ concludes with a programme of Finnish organ music given by Lee Dunleavy. 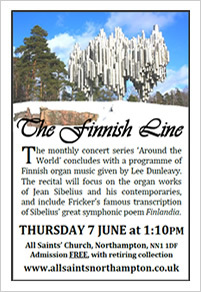 The recital will focus on the organ works of Jean Sibelius and his contemporaries, and include Fricker’s famous transcription of Sibelius’ great symphonic poem ‘Finlandia’.